Funny that life gets so hectic at times and the first thing I give up is the gym. For years it was sleep and I found that walking around like a zombie wasn't working for me. 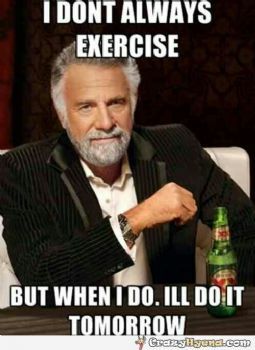 So now I give up exercise. But why? It is the one thing that makes me feel the best and yet I eliminate it from my daily schedule when I am feeling unbalanced. What is wrong with this picture? What do I give up? I don't know. Today I am going to hit the gym after work instead of waiting for the bootcamp class. Maybe this will make the difference for me? I am hopeful that it will stop my desire to nap after work as well. I hope so. I need to make this all work. It is just too important. Life would be easier for many if they did the things that seemed the hardest consistently. Hope you made it to the gym after all. Yes the time to go is now...because you want to. Do enough to make yourself feel good about it, but it would probably be best to not go gung ho lest you overdo and take the fun out of it. Its consistency that counts, not how fast you can exhaust yourself and turn yourself into a puddle on the floor.